What Can Music Therapy Achieve? Research demonstrates that music therapy, integrated into a care plan, may improve health outcomes and quality of life. Through developing individual potential and improving intrapersonal and/or interpersonal integration, music therapy addresses a person’s cognitive, emotional, physical, social, and spiritual needs. Please note that music therapy does not claim to cure or prolong life in the medical sense. The human ability and need to respond to music is innate, is not dependent on musical ability or training, and usually remains unimpaired by mental and physical illnesses. Music has a unique power among the therapeutic media to engage and sustain the attention of patients and, in the hands of a certified and trained therapist, accomplish a variety of therapeutic goals and objectives. 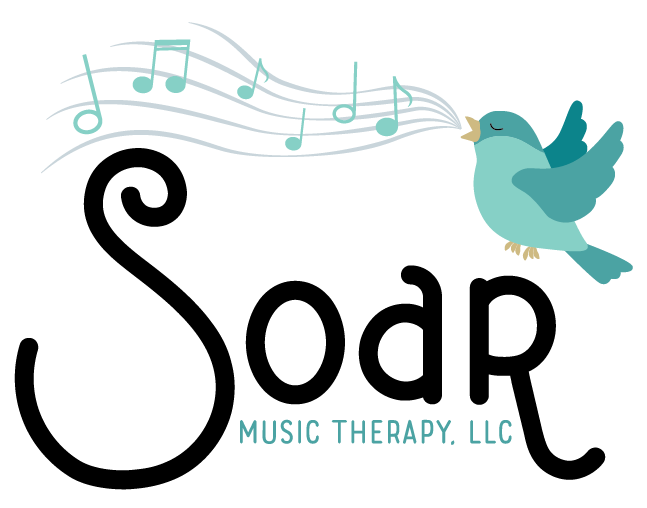 Who Are Soar Music Therapy Clients? Soar clients can be individuals, agencies, or corporations. Our music therapy clients may be recovering from or learning to cope with illness, injury, or disability. Our wellness clients may be in good general health but want to learn techniques to optimize and maintain their mental and physical health. We work with corporate clients to help develop and enhance communication, leadership, and stress-management skills. Is Music Therapy Covered by Health Insurance? Unfortunately, due to the difficulty to get music therapy covered by insurances, we will not be accepting insurances for services. Music therapists use vocal and instrumental music strategies and protocols for individual and group therapeutic sessions to help clients reach their non-musical goals. How long is a Music Therapy Session? Depending on the client or group, ranging anywhere from 15-60 min. How Many Sessions Should One Participate In? Depending on the individual’s needs, music therapists may only perform a handful of sessions with a client, such as in hospital settings. Music therapists may only meet with a client once, such as providing support for patients who are passing away and their families. Clients with chronic, prolonged, or reoccurring diagnoses may see a therapist for generally up to two years, at which point objectives should have achieved and wellness strategies may take the place of music therapy. However, every client-therapist relationship is unique and no generalization will appropriately include treatment for all clients. What Takes Place In a Typical Session? Music therapists serve a wide variety of populations with diverse needs making it hard to outline a “typical” music therapy session. Music therapists draw from an extensive array of music exercises, strategies and interventions in order to design sessions and select music based upon the individual patient’s treatment plan. In a medical setting, a music therapist adapts to the needs of patients seen in a series of visits. Accompanied by a cart equipped with musical instruments, song books, and recorded music, a therapist travels from room to room, conducting sessions varying from 15 to 60 minutes in length. After assessment and brief discussion of a patient’s needs and preferences, intervention begins. A session may consist of only the therapist providing music or the therapist and patient making music together. What kind of Instruments does a Music Therapist Use? Every music therapist specializes in at least one instrument and is able to play a minimum of guitar, keyboard/piano, percussion, and voice (for chanting, singing, and toning). Music therapists are trained to make necessary adaptations to make instrument play accessible for all regardless of physical, cognitive, or musical abilities. What if I’m interested in Music Therapy but cannot sing, play, or read music? The ability to respond to music is completely natural within every person. And since music therapy addresses non-musical goals, patients need no prior music training or advanced skill to participate in music therapy sessions.